Turn of the century view looking southeast down Flanders Rd from the traffic circle in Riverhead. The shingled building to the left survives. Postcard donated by Liz Strebel. Along the way...this postcard image is an artist's rendering of what was once known as "Havens Creek". The view is looking northeast from the vicinity of Dam Trail towards the Point Rd launching ramp. Image is from the collection of G.Cobb. Walter Havens Sr., a son of Constant Havens of Shelter Island, married Desiah Goodale the daughter of Joseph Goodale of Bridgehampton. Joseph was the brother (possibly a twin) to Josiah Goodale who is credited with being the first Southampton colonist to settle in Flanders circa 1760. Walter and Josiah's niece, Desiah, settled in Flanders circa 1785 and acquired a considerable tract of land that included the majority of the hillside that lies between Chauncey Rd and Pleasure Dr. Walter Sr's home was located near the intersection of Flanders Rd and Oak Ave near the head waters of "Havens Creek" (Havens Creek, as it was known, passes under Flanders Rd and Dam Trail before emptying into Reeves Bay just southwest of the Point Rd. launching ramp). The photograph is of his son Walter Jr. Image courtesy of Walter Jr's great-great-great-great-grandson Frederick Walter Havens. The Arden Squires house was located between East Ave and Chauncey Rd near the western boundary of the old Village of Flanders. The house was destroyed by a fire in April of 1921 at which time it was also serving as the Flanders post office. Photo donated by Arden's grandaughter Shirley (Reeves) Lutz. Arden Squires, great-great-grandson of Ellis Squires who had first dropped anchor in Goose Creek (1773) before relocating to the "Squiretown" section of Good Ground, with his wife Louisa (Munsell) and their 11 children. Ellis and his family had relocated from Machias, Maine a bustling coastal lumbering colony near the Canadian border. Machias was a haven for pirates and privateers during the French and Indian wars and also the scene of the first naval battle of the American Revolution. A few decades after Ellis' arrival another Machias family, that of Charles and Dorcas (Foss) Smith relocated to Flanders and settled on Otter Hole Neck (the colonial place name of the land that is now home to the Big Duck) Photo donated by Shirley (Reeves) Lutz. The circa 1800 Smith home at Otter Hole Neck. Photo is courtesy of Charles' great-great-great-great grandson David Wilcox. This surviving, although extensively renovated, one-and-a-half story center-chimney structure was very likely to have been a part of the original Smith homestead. G.Cobb photo. Chauncey Havens, for whom Chauncey Rd is named, was Walter Jr's grandson. Chauncey and his 2nd wife, Mary Alice (Squires), operated the popular 25 room summer hotel that was known as "Havens House". Havens House was located on the hillside slightly east of today's "Blue Barn" (refer to sidebar) The hotel was destroyed by fire in 1924. Image courtesy of Fred Havens. Chauncey's grandson, Fred C. Havens, who was known as "Ted" built his home near the site of the former hotel and relocated the hotel's carriage barn (known today as the "Blue Barn") further west along Flanders Rd. This photo of Ted captured the barn in its original location. Photo courtesy of Ted's grandson Mark Hansen. A bit further east along the hillside visitors were soon welcomed by "Squires House". Postcard donated by Ida Crohan. 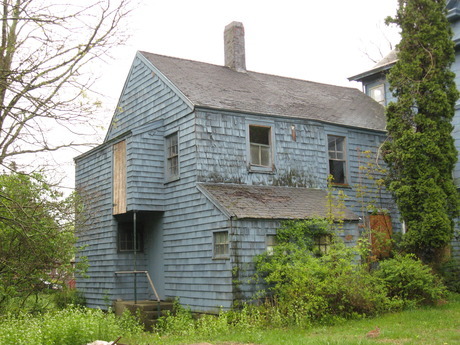 "Squires House" (aka "Range Hill") was a boardinghouse that was operated by the Squires family and overlooked what is now Strongs Marine from the hillside that is slightly west of the Flanders firehouse. Photo (circa 1910) donated by L. Austin. Guests enjoying the view from the front lawn. The steps that are visible in the left foreground survive. Photo donated by L. Austin. The steps as they look today . G.Cobb photo. 1907 Postcard of Squires House and view east. Postcard donated by L. Austin. Barney and his brother Harvey, who operated the boardinghouse, were great-grandsons of Ellis Squires and uncles to Arden. Photo donated by L. Austin. "Uncle Barney" peel'n and pluck'n. Barney was an uncle to Lyle Austin's grandmother, Emma Moore. Photo donated by L. Austin. 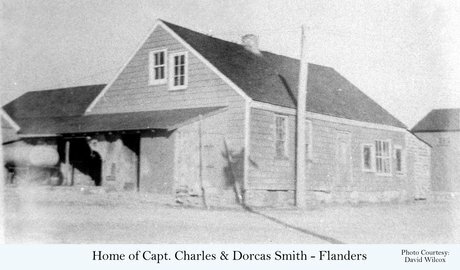 The Benjamin family operated at least two hotel/boardinghouses one of which was located next door to the Squires' place on land that is now home to the Flanders Fire Department. 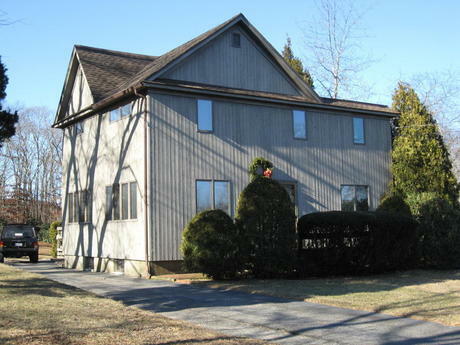 Among the proprietors was Alanson Benjamin (1823-1897), the son of Zachariah Sr. and a grandson of James Benjamin, whose homestead (circa 1782) survives at 1182 Flanders Rd. Photo from the collections of the Suffolk County Historical Society. At one time this building served as the Flanders Post Office. It was roughly located across Flanders Rd from Squires House near present-day Firehouse Rd but was relocated further west on the hillside and has been converted into a private residence. The sign on the roof proclaims "500 feet to the Rest-Awhile" , which was likely a reference to "Methodist Point". Methodist Point was the homestead of Methodist Episcopal Church trustee Samuel Griffing (Samuel married Arden's sister Annie) who had no doubt welcomed fellow parishioners to his property for religious gatherings and revivals. Methodist preachings to this day refer to Mark 6:31 which reads..."Come ye yourselves apart into a desert place, and rest a while...". What better place than Flanders? Postcard donated by Stephanie Davis. As a young man Samuel Griffing made his living aboard the ships that carried cordwood between Flanders and New Haven but eventually settled down on his father's (John Griffing) farm to raise poultry (circa 1890). John Griffing had purchased this property, in 1858, from the estate of Capt. Charles Smith. The Griffing farm was the first in Flanders to give ducks a try and by the turn of the 20th century they were raising in excess of 5,000 ducklings annually. Samuel's daughter Blanche married Thomas Irving Havens (Chauncey's son) who would eventually take over the management of the Griffing farm. Thomas, or T.I. as he was known, gifted the Flanders Mens Club (not to be confused with the "Flanders Club") their building and grounds which, up until that time, had been used to raise ducklings. Postcard donated by Ida Crohan. This view of the Griffing farm looks notheast with the coastline of today's residential community of Waters Edge visible in the background. Postcard donated by Ida Crohan. "Methodist Point" with Percy Moore's barn in foreground. Percy Moore, a carpenter by trade, was the son of Mervin and Charlotte (Horton) Moore of Cutchogue. Percy married Emma Jane Brown whose mother Deborah Ann (Squires) Brown was a sister to Harvey and Barnabas. 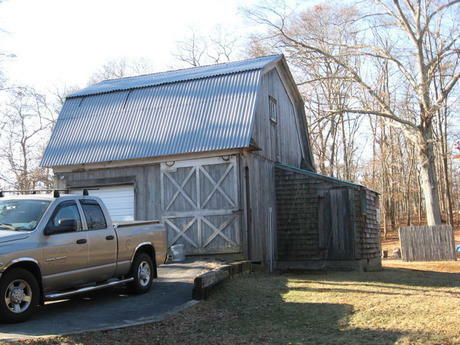 Percy's barn and home, which survive, were relocated to the hillside near the site of the Squires boardinghouse when Flanders Rd was widened in 1931. Photo donated by Percy's grandson Lyle Austin. Emma Jane (Brown) Moore was the daughter of Sydney and Deborah Ann (Squires) Brown. Emma's grandparents, Harvey and Jemima (Fanning) Squires, were the proprieters of "Squires House". Photo courtesy of the Suffolk County Historical Society. Emma (Brown) Moore's mother, Deborah Ann (Squires) Brown (1861-1953) Photo courtesy of SCHS. A colorized postcard of the Samuel Griffing farmhouse located on the penninsula that had become known as "Methodist Point". The two masted schooner at anchor in the background near what was known as "Flanders Landing" may be the "Circle" which was owned by Capt. Nathan B. Hallock. Capt. Hallock's home and summer hotel were both located near the landing which was near present-day Bay Ave. Postcard from collection of G.Cobb. The James Benjamin Homestead (1182 Flanders Rd), to the east of Percy, was built in 1782 and later served as a boarding house and also, for a time, as the local postoffice. 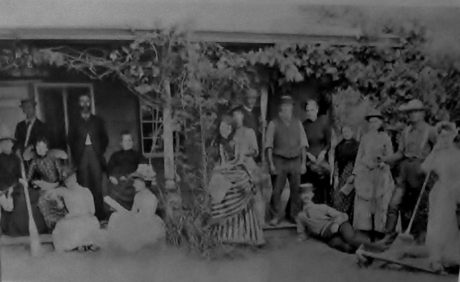 This image, a photograph of a circa 1870 tin type, captured James' grandson, Alanson (bearded gentleman in center), his son Zechariah (right side with shotgun) and a few of their guests on the front porch which has long since been removed. The photo is courtesy of Alanson's great-grandaughter, Laurel (Benjamin) Rosati. This view looks east with the church on the right and Josiah Hallock Goodale's boardinghouse, known as "Willow Cottage", on the left. J.H. Goodale was a great-great-grandson of Josiah Goodale (1736-1786) who was the first (circa 1760) Southampton native to settle in the "Ocabogue Division of the Quogue Purchase". The area was renamed Flanders circa 1794. Willow Cottage is located on, or very near, the site of Josiah's circa 1760 homesite. Postcard donated by Ida Crohan. In 1858 Oscar Goodale sold a 50x124 parcel of land to Southampton School District #4 for $50.00 upon which was constructed the first Flanders schoolhouse. An attempt was made to burn it down in November of 1869 (perhaps by students looking for an extended Thanksgiving recess ...) and it was in fact claimed by a fire in 1886. The structure was rebuilt circa 1888 and survives to this day as a private residence. This postcard captured the schoolhouse as it looked circa 1910. Postcard donated by Ida Crohan. Class picture taken in front of school circa 1870. Image courtesy of Gary Minnick. This view looks west at "Willow Cottage" with church (Methodist Episcopal at the time) in background. The church is in its original construction location but was relocated to its current location, further back from the road, in 1930 when Flanders Rd was widened. Postcard donated by Ida Crohan. Circa 1900 view looking west down Main Street from "Grove House" which would later come to be known as Brewsters boardinghouse. The road was rerouted slightly to the south in 1930 creating the median that is now the Flanders Memorial Park. Image of colorized postcard from collection of G.Cobb. Capt. Robert W. Penney's "Grove House" (aka Brewsters boardinghouse). The Flanders Club headquarters building, which was built in 1891 and later relocated (1922) to serve as the boardinghouse kitchen, is to the right of the hotel. The Club's lodge, which was destroyed by fire circa 1920, is in the background. Postcard image is from the collection of G.Cobb. Fire, a constant threat to the Club's holdings, struck again on March 5, 1950 when it claimed their "Main House".Wendell Reeve captured the event in this photo which was donated by Ted Havens' grandson Mark Hansen. This is the cover of a log that belonged to George W. Brown whose homestead survives at 1553 Flanders Rd opposite Long Neck Blvd. George, who had the reputation of being the best hunter in the area, was employed by the Flanders Club as a guide and to control the resident varmint population that lived on the Club's substantial (10,000 acres) territory. The log annotates the taking of snake, rat, muskrat ,mink ,weasel, possum, woodchuck, skunk, squirrel, crow and bluejay which all posed a threat to the eggs of the thousands of gamebirds that were raised and released on the Club's lands as well as kingfishers and cranes (probably egret or heron) which fed on the trout that were stocked in the Club's ponds and streams. Fox, owl, hawk and cat (bobcat) were also harvested as they posed a threat to the gamebirds themselves. George was also hired for various farming tasks such as plowing and fence mending and to act as a guide for the Club's hunting outings. Log is on loan from George's step grandson, Paul Holschuh, whose mother, Evelyn, was married to George's son Elbert. These are George's entries for the month of November 1891. Take note of the $4.90 earned for a day's work, big money in those days. This page summarizes 1891 and begins 1892 with time spent "Out with the gunners."